For any organization to survive and prosper, there must be a strong driving force within the organization. That force must contain just the right combination of wisdom, compassion, trust, and honor. 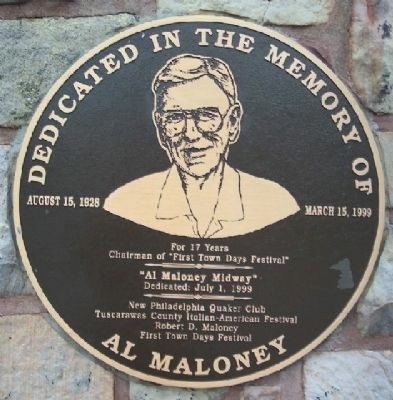 Al Maloney was the driving force of First Town Days Festival. He had the wisdom to create and maintain a clean and wholesome environment for the many thousands of visitors he entertained year after year. He had compassion to form a bond with many festival vendors that brought them back each year in friendship. He had the trust of the city fathers that his festival was a good thing for New Philadelphia, and the crowds that followed would confirm this trust. And finally, he had the honor of his community for being the kind of individual who made the whole town a better place in which to live. 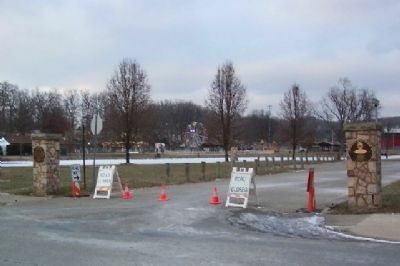 His memory will be especially bright when the warm summer breezes gently blow through the trees of Tuscora Park, and his footsteps will always be heard on the Midway of First Town Days. 1999 by New Philadelphia Quaker Club, Tuscarawas County Italian-American Festival, Robert D. Maloney, and First Town Days Festival. Location. 40° 29.989′ N, 81° 26.604′ W. Marker is in New Philadelphia, Ohio, in Tuscarawas County. Marker is at the intersection of Tuscora Avenue and Lake Street, on the right when traveling west on Tuscora Avenue. Touch for map. Markers are at south entrance to Tuscora Park, just southwest of the tennis courts. Marker is in this post office area: New Philadelphia OH 44663, United States of America. Touch for directions. Other nearby markers. At least 8 other markers are within walking distance of this marker. C. William "Bill" Kidd (about 700 feet away, measured in a direct line); Tuscarawas County World War II and Korean Conflict Memorial (approx. 0.7 miles away); Revolutionary War Memorial (approx. 0.7 miles away); War Saving Stamps (approx. 0.7 miles away); Congressional Medal of Honor Recipients (approx. 0.7 miles away); Tuscarawas County World War I Memorial (approx. 0.7 miles away); Tuscarawas County Viet-nam Veterans Memorial (approx. 0.7 miles away); Tuscarawas County Civil War Memorial (approx. 0.7 miles away). Touch for a list and map of all markers in New Philadelphia. More. 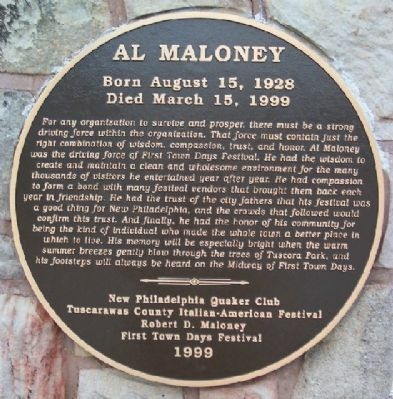 Search the internet for Al Maloney. Credits. This page was last revised on June 16, 2016. This page originally submitted on January 12, 2009, by William Fischer, Jr. of Scranton, Pennsylvania. This page has been viewed 658 times since then and 10 times this year. Photos: 1, 2, 3. submitted on January 12, 2009, by William Fischer, Jr. of Scranton, Pennsylvania. • Kevin W. was the editor who published this page.